Improve product display areas with easy-to-use systems that are sleek, easy to use and built to last. Benefit with easy graphic integration and modular construction when selecting our merchandising solutions. Cohesive details are important for your brand. Choose items like custom 3D lettering, stand-off graphics and LED light boxes to complete your look! Our retail banners and graphic stands range from counter top to floor models, single or double-sided and are offered in a variety of materials: fabric, vinyl, laminated or direct print to metal, wood or PVC. We offer aluminum slat-wall kiosks, iPad, catalog and literature stands, mobile demo tables and other presentation accessories that meet your needs. From training centers to cafeterias, extending the corporate brand helps team members embrace company culture and beliefs. In conference rooms and lobbies, customers can gain knowledge of your services while in an environment that makes them feel welcome and appreciated. Large and small solutions customized to enhance various environments. Custom or graphic kiosks and reconfigurable display systems. Many options for informational graphics, including wallpaper, board-mounted and direct-print solutions. Three-dimensional and printed signage in acrylic, metal, wood or PVC. Metal, acrylic, wood or plastic 3D logos and signs make for attractive details in your space. From specialty surface treatments and finishes to custom-printed wall paper. Don't be shy — express yourself! 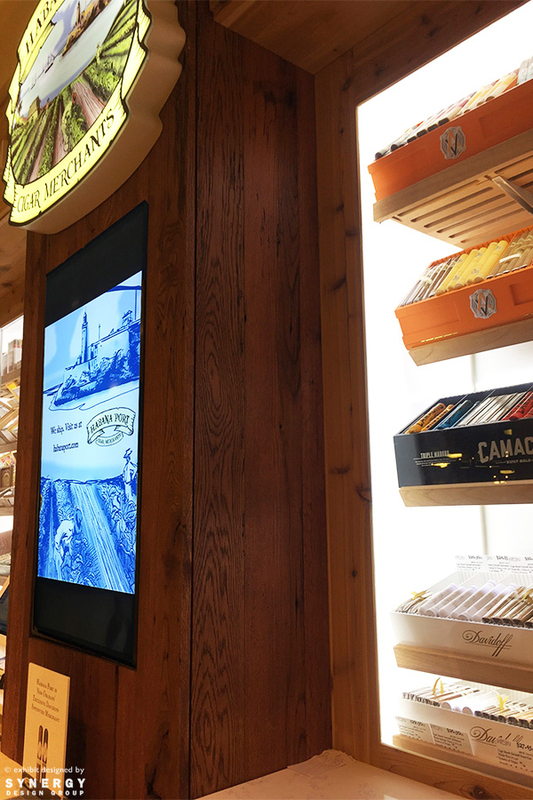 Custom show cases, plaques, information kiosks and mall kiosks. 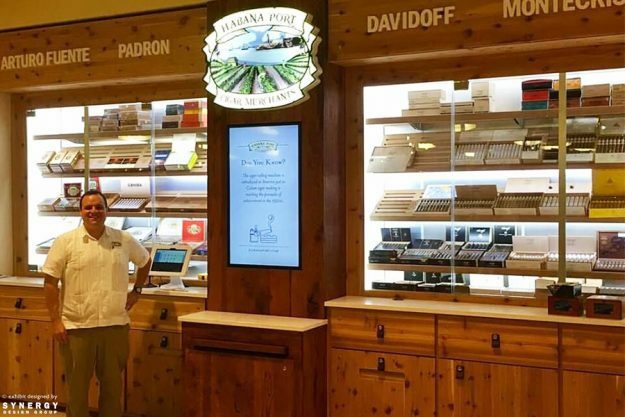 Our client, Habana Port Cigars needed a custom retail display for their location at the New Orleans Riverwalk. The father and son duo behind Habana Port were a lot of fun to work with. The challenge: one loves traditional elements while the other loves a more modern look. Therefore, we developed a custom solution to combine the essence of both with their brand. In order to appeal to the old-world taste and for cigar storage function, we used cedar to create the custom, wall-sized humidor and added leather pulls for a distinct feel. White quartz countertops, white acrylic 3D product names, and clean and bright LED side panels define the contemporary feel. In addition, the LED panels illuminated product in an elegant way. Functional elements include hidden vents for the display to work as a huge wall humidor. The custom solution also has accessible storage on the cabinetry behind the top signage. The central pylon vertical retail screen and custom shaped signage tied together the modern materials and traditional finishes to create a professional and functional presentation. Although our client moved from the Outlet Collection Riverwalk Mall in 2018, this project remains one of our favorites. The impressive details make this custom humidor retail display unique. Our client was pleased with the cohesive blend of old and new worlds that perfectly exudes Habana Port Cigars. Born deep in the belly of New Orleans, we have a knack for creativity, fun and resilience. Just like our city. When there is synergy, a mutually advantageous conjunction of distinct elements is in play. We create synergy using your marketing tools within your exhibiting strategy, so the end result exudes professionalism and credibility.